It was Give Kids a Smile day, a program held statewide that provides free dental care to local children who wouldn’t otherwise have access. The program has been active in Minnesota since 2003, and 2019 marks the ninth year that SCTCC has participated. Second-year dental assistant and dental hygiene students, along with four local dentists, were able to see 45 kids on Friday. This year they ended up having to turn away 10 people. “There is a definite need in the community to be able to service children who don’t have dental care,” said instructor Char Randall. Randall said this is also great experience for the students to get a taste of what the setting will be like in the dentist’s office. Dr. Andy Wilcox was one of the four dentists who volunteered his time during the event. It was his first year at Give Kids a Smile; he gets many SCTCC interns and hires graduates, so he knew the SCTCC location would be a good fit. 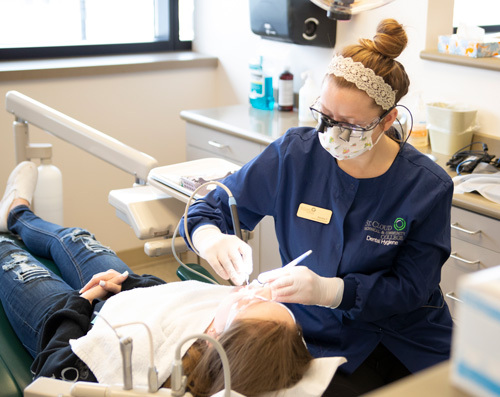 “Dentistry is a hard thing to access for some people, and if we can offer an event like this, it’s nice to help out kids and parents who wouldn’t otherwise be able to,” said Wilcox. The Give Kids a Smile event was made possible by the Minnesota Dental Association, volunteer dentists, sponsors, faculty, staff, and students in the SCTCC dental hygiene and assistant programs.